And so we came to the 35th and final church of our marathon weekend in north-west Norfolk. It was Sunday, 8th May 2005, my 44th birthday, which I had not been looking forward to. Our escape, originally planned by Jacquie as a way of preventing my misery from affecting everybody else, had turned out to be a splendid cavalcade of marvellous pubs and walks and churches, mostly in brilliant Spring sunshine. I would always remember it. 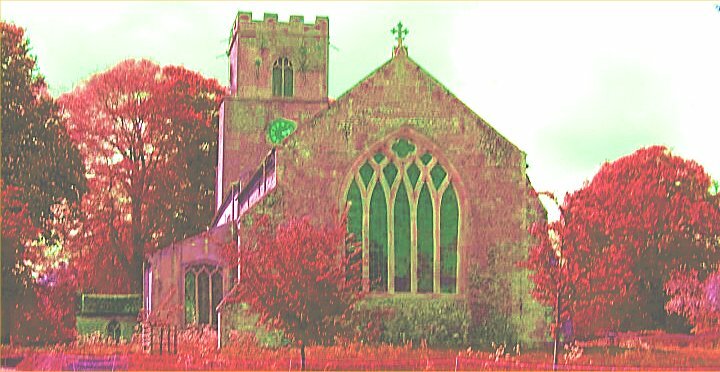 Jacquie, being somewhat younger than me, was unable to sympathise with my sense of mortality, but I did win her over to some of the churches, especially South Creake. And also here, St Mary at Great Snoring. A minor building by comparison, but there was something so lovely about the sheep and lambs in the spring sunshine of the churchyard that the heart was buoyed up and sensitised to what was coming next. Where the sheep hadn't been yet, the graveyard boiled with cow parsley. As I waded through it to get a shot from the north-east corner, a couple of small brown furry things broke under my feet and headed for cover. I'd like to think they were rabbits, but they probably weren't. It was a useful reminder not to go exploring springtime churchyards in shorts. St Mary is a sturdy aisled and clerestoried building. As at Little Snoring, there is a smell of age and damp inside the church, which is very well kept but not antiseptic. Although there is a grand Norman font, much of the character is Decorated, with a Perpendicular chancel arch and a patina of Georgian from the major 1800 restoration. Although Great Snoring is actually smaller than Little Snoring, its church is bigger and less rustic; it reminds us quietly that it was once grander. The rood screen is little documented, but has just two intriguing surviving painted panels. One depicts the Holy Trinity in the form of God the Father holding the crucified Christ while a dove descends. This representation is not that uncommon in medieval churches, but it is unusual on roodscreens. You can also see it at Attleborough. The panel beside it depicts Mary and the infant Christ, at once tender and beautiful. Trinity, Nativity... hmm. I wonder if the other panels were also representative of feast days of the medieval church? The decalogue board is massive, and facing across from it are royal arms to James II. Because of his popish reputation, these are relatively unusual, but strangely enough there is another set across the fields at Little Snoring. A medieval brass to Ralph Shelton is badly damaged, but his wife still survives, pretty much. An alabaster wall monument has also been knocked about a bit; the 18th century communion rails are obviously the hand of a local carpenter, and all in all I found this slight tattiness very endearing, as is the memorial to brothers who, alas, died of smallpox. More moving still is a surviving WWI cross. These were the original gravemarkers on the battlefields of northern France, which were returned to the home parishes of the dead when more permanent memorials were built. There used to be thousands of these in English churches, but they in turn were mostly thrown out or given to families when the churches installed their own war memorials, and not that many survive today. What makes this one especially powerful is that it was varnished as soon as it was lifted, and the Flanders mud is still there, under the veneer. Haunting. So that was that. It was time to say farewell to the sheep and the lambs, and to Norfolk, and head south. East Anglia in the spring is at its loveliest, and the hedgerows were wild banks spangled with yellow and red as we made for the bigger roads; and then the tunnel of trees in the forests between Swaffham and Thetford, a perfect confusion of thousands of greens, dappled and quivering, throwing light like tiny coins on all the verges, until we reached the Suffolk border, and were out of it.